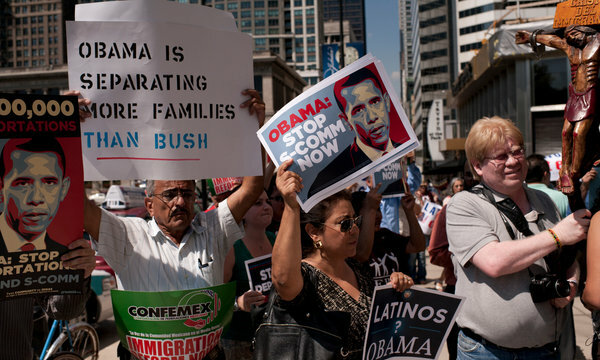 In Chicago on Tuesday, a protest against policies leading to deportations. A program that is central to President Obama’s immigration enforcement strategy has drawn protests by Latino and immigrant organizations in six cities in the last two days, as those groups stepped up their confrontation with the administration over the fast pace of deportations. In Los Angeles, about 200 immigrants and their supporters walked out of a stormy hearing Monday evening that was called by a task force advising the enforcement program, known as Secure Communities. Bearing signs that said “Stop Ripping Families Apart,” the protesters called for an end to the program, which they said had led to the deportation of victims who reported domestic violence to the police, and to parents of American citizen children. On Tuesday in Chicago, several dozen protesters delivered thousands of petitions calling for an end to the program to the headquarters of Mr. Obama’s re-election campaign. Petitions were also delivered by small groups of protesters to Democratic Party offices in Miami, Atlanta, Houston and Charlotte, N.C.
About two dozen prominent immigrant advocacy organizations issued a report denouncing the program and calling on the administration to halt it. Organizers said the protests were a response to an announcement on Aug. 5 by Immigration and Customs Enforcement, the federal agency that runs Secure Communities, that the program would continue to expand to meet its declared goal of covering the whole country by 2013. Clarifying doubts about whether states and cities could choose whether to participate, John Morton, the agency’s director, said that agreements with state and local officials were not required for the agency to proceed. President Obama has made no headway in a divided Congress toward an immigration overhaul that would give legal status to millions of illegal immigrants. At the same time, in each of the last two years immigration authorities have deported nearly 400,000 people. Under Secure Communities, fingerprints of anyone booked into jail by the state and local police are sent to the F.B.I. for criminal checks — long a routine practice — and also to the Department of Homeland Security, which records immigration violations. Immigration agents decide whether to detain noncitizens signaled by fingerprint matches. The ferment on Tuesday exposed vastly differing views of the program between immigrant advocates and Obama administration officials. In an interview, Mr. Morton said the program was working effectively to carry out his agency’s focus on deporting immigrants convicted of serious crimes. “It’s the law, and we think it is very good policy, to focus our resources on people who are here unlawfully and also committing crimes,” Mr. Morton said. He said agency figures showed that about 90 percent of those deported under Secure Communities since it was started in 2008 were either convicted criminals or foreigners who had failed to obey a court order to leave the country or who had returned to the United States illegally after deportation. Immigration officials pointed to the arrest in January in Los Angeles of a Mexican man on charges of driving with a suspended license. After a Secure Communities match, the police learned that he had been convicted of drug trafficking and burglary and deported six times. Another Mexican arrested in Los Angeles was found to have been convicted in the killing of a child in 1997. Mr. Morton said he had created the advisory task force, which went to work in June, to recommend fixes that would lower the numbers of deportations of illegal immigrants who did not have criminal convictions. Also on Tuesday, the American Immigration Lawyers Association published a report that cast light on how Secure Communities and other enforcement programs have stirred tensions in immigrant communities. The association, which includes 11,000 immigration lawyers, polled its members to see how many were handling cases of immigrants facing deportation after being stopped by local police officers for minor offenses, like traffic violations. Gregory Chen, director of advocacy for the lawyers’ association, said his office was deluged with responses. “Department of Homeland Security practices have ushered in a sea change in who is being deported, and our attorneys have literally been flooded with people coming in to their offices who have been picked up by local police for small time stuff,” Mr. Chen said. The report, which presents a sample of 127 cases from 24 states, was the “the tip of the iceberg,” he said. The lawyers’ report includes the recent case of an immigrant in New Mexico detained for deportation after the local police questioned him about burning leaves in the front yard. A woman in Minnesota was held by federal agents after the traffic police stopped her saying she failed to signal a right turn. An immigrant facing deportation from Florida was a passenger in a vehicle pulled over in a traffic stop; the vehicle was driven by his wife, a United States citizen. In 87 cases, the report found, the illegal immigrants facing deportation had no criminal history, and 79 of them were close relatives of American citizens or legal permanent residents. Many had lived for more than a decade in the United States. Eleanor Pelta, the president of the lawyers’ association, urged Mr. Morton to improve screening procedures so that arrests by local police did not lead automatically to federal deportation. Fear and frustration about Secure Communities spilled over during the hearing on Monday in Los Angeles, one of five organized by the task force. One speaker, Isaura Garcia, 20, said she had been reported to immigration authorities by the Los Angeles police after she called 911 when she was beaten by her boyfriend. The program drew praise from a representative of a Los Angeles County supervisor, Michael D. Antonovich, a Republican. But an official from the office of Mayor Antonio R. Villaraigosa, a Democrat, echoed immigrants’ criticisms. Shouting erupted after one citizen, Julio Giron, yelled from the crowd to defend the program, which he said was needed because Mr. Obama had failed to secure the border. Soon after, most of the opponents, who significantly outnumbered the supporters, marched out, calling on the task force to resign. Reprinted from The New York Times, National, of Wednesday, August 17, 2011.